While editing a document to change dates from one semester to the next (syllabus editing, anyone?) might be the epitome of administrivia, Blackboard, fortunately, has a handy Date Management tool to automatically make many such updates. First, bring your old content into your new Blackboard course shell (using the Course Copy or Import tool). Second, use the Date Management tool to adjust all Bb dates (such as due dates and availability dates) to match the new semester for your copied or imported content. In most cases, choose the “Use Course Start Date” option, and set the first class session as the new course start date. 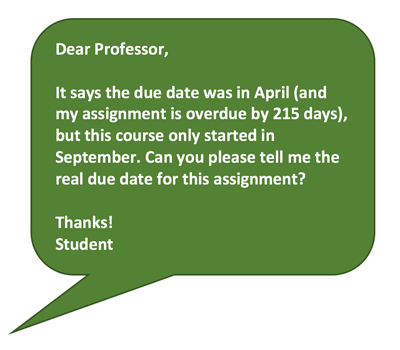 All due dates will then calculate and update accordingly.